Imagine a virtual flashmob on Twitter feed. All your followers broadcasting the same message at the same time. A team out of Startup Weekend San Jose in April 2011, set out to create that exact tool. Over the course of 48 hours the team coded and launched it only fourteen hours after writing the first line of code. The result was Shout A Tweet, a site which allows anyone to create a Twitter campaign that allows them to create a message, set the number of followers to tweet, schedule the tweet, and when enough people join the campaign, automatically send the tweet. The way it works is similar to any other site or app that allows you to send out tweets. Much like TweetDeck or HootSuite, you grant permission to your twitter account to publish. Users can then type a tweet, define how many supporters you want to wait for until shouting, set the shout time and click Shout. Shout a Tweet then creates a short URL for easy sharing with supporters to join the campaign and monitor the progress of the campaign. Their pricing model is pay as you go. To begin, users get 50 credits. 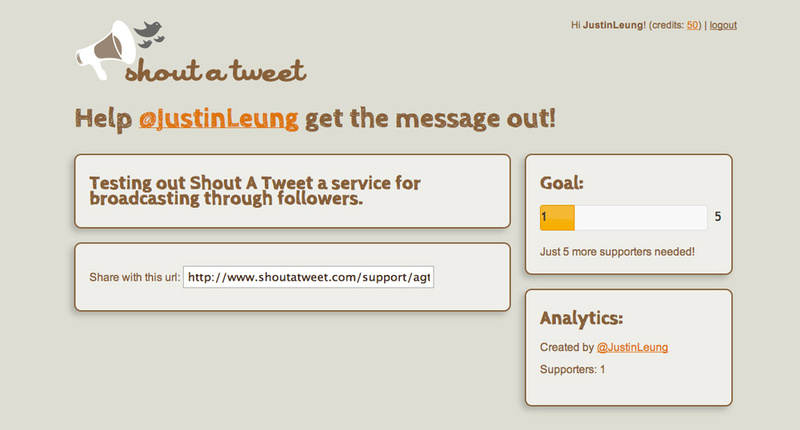 Each credit is one tweet from one supporter, so you can create 10 campaigns with 5 supporters each. After that, you can buy 100 more credits for $10, 500 for $45, or 1000 for $75. Anything above that is about 10¢ per tweet. Wether it is for a school fundraiser, political campaign, or spontaneous flashmob, Shout A Tweet provides a simple solution to anyone who wants to organize their supporters to send a single unified message without compromising security. It is a good option, but at 7.5¢ to 10¢ per tweet the pricing is a bit high for volume organizers. We will hopefully see more reasonable pricing schemes in the near future.